Approximately 1,400 households live within ¼ mile, and 5,000 households are within 1 mile of the Greenway. Many destinations including schools, shopping centers, medical facilities, and places of worship are within walkable/bikable distance from the Greenway. 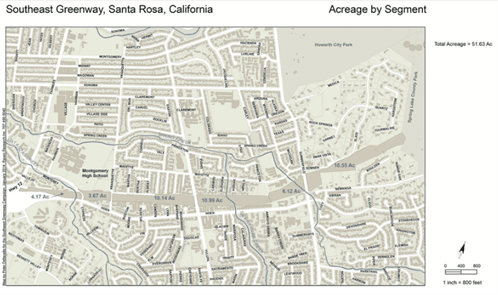 Click on each of the map thumbnails below to view an enlarged image. This is a recent aerial photograph of the Greenway vicinity with the Caltrans property proposed for the Greenway outlined in green. 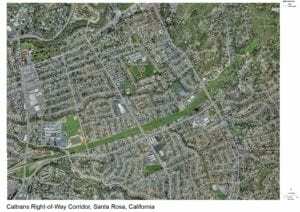 This picture clearly shows the undeveloped two-mile corridor surrounded by the urban development that has taken place since Caltrans purchased the right-of-way in 1959-72. 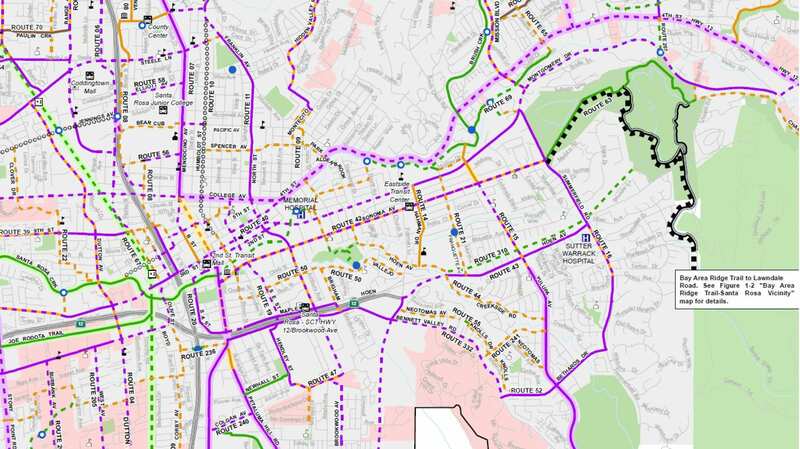 This map was prepared by Pete Dellavalle and Bob Gaiser for the Greenway Campaign. It shows the number of acres for six segments of the Greenway and the existing buildings, lot lines, street names and streams in the area surrounding the Greenway. 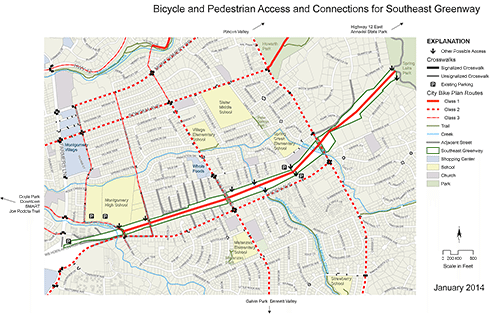 This map was prepared for the Greenway Campaign’s Bicycle-Pedestrian Work Group by Pete Dellavalle and Bob Gaiser. 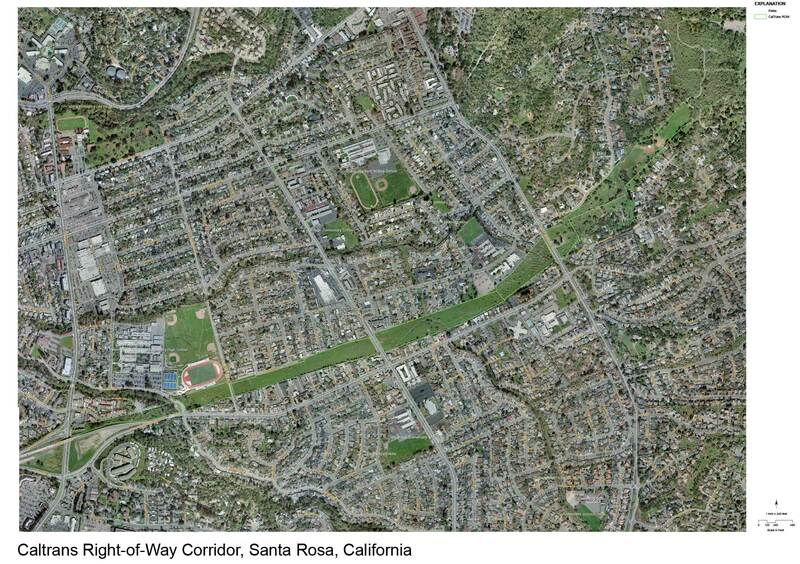 It shows the existing streets, parking lots and access points adjacent to the Greenway and the bike routes designated in the City of Santa Rosa’s Bicycle-Pedestrian Master Plan for the Greenway area. 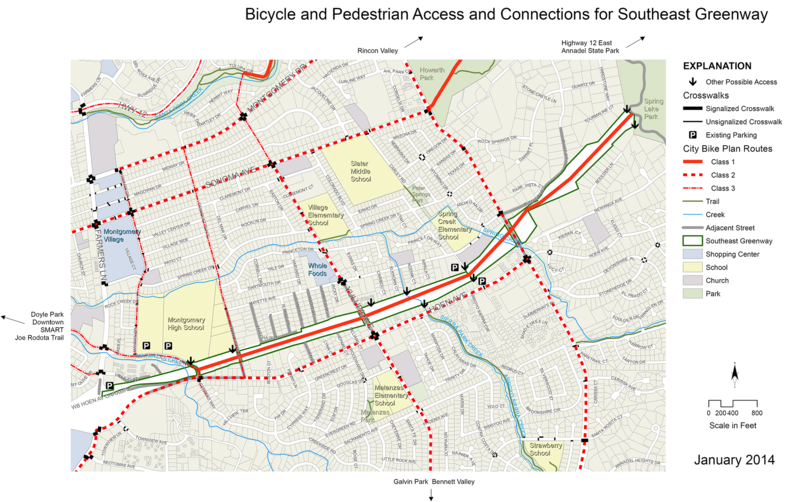 A Class 1 bicycle path is proposed for the Greenway from Hoen Avenue to Spring Lake Park. 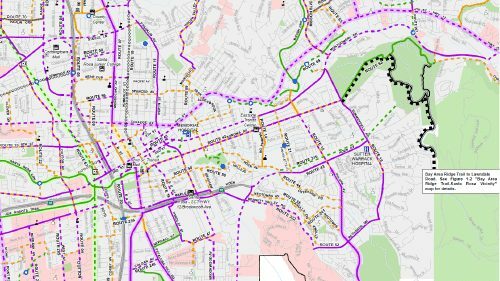 This map shows the bike route designations in the City’s Bicycle-Pedestrian Master Plan for a large portion of eastern and central Santa Rosa. Route 310, shown with a green dashed line on the right side of the map, is the Class I bike path on the Greenway. 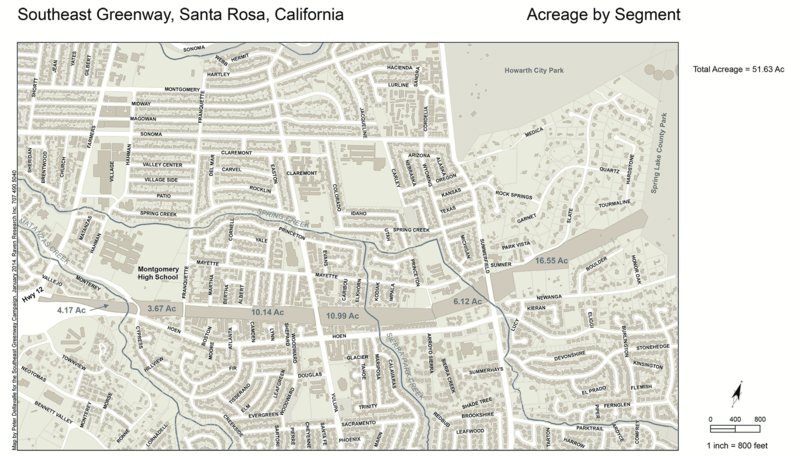 This path will help connect Spring Lake Park and the proposed Bay Area Ridge Trail on the east with downtown Santa Rosa to the west and the nearby Joe Rodota Trail, Santa Rosa Creek Trail and north-south SMART bike path.